Housebreaking Your Puppy- Made Easy! How to housebreak your new puppy. You really don’t need a trainer in order to housebreak your dog if you follow these 3 easy steps. 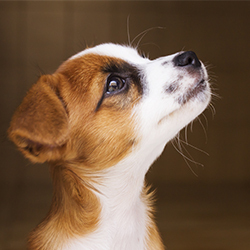 Make sure you have a set schedule for feeding and watering your puppy. 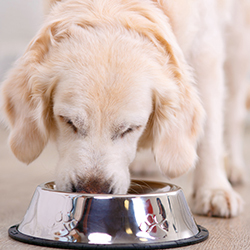 Free feeding is one of the best ways to ensure a long and messy few weeks while training your dog to “go” outside. 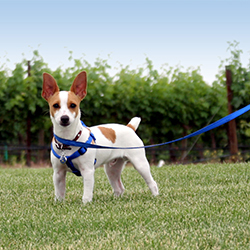 About 20-30 minutes after your puppy has had food or water take them outside, on a leash, to the desired potty area. Make sure to take them to the same location each time, this instills a habit of “this is where I potty” and make clean up much easier in the long run. Do not play with them or allow them to get too distracted and give the command of your choice to potty. Make sure they go potty and when they do PRAISE them! If they don’t go bring them back inside and place them in a kennel for 5-10 minutes then try again. Until you are confident do not allow your dog to roam freely in the house. This is an accident waiting to happen. 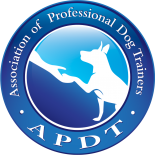 If you do catch them starting to go, then immediately & firmly tell them NO and take them outside to their potty area, and give the command to potty. LOTS OF PRAISE WHEN THEY GO! If you catch them before the go inside congratulations! If not remember it is YOUR FAULT, not the dog’s, that they messed in the house. It’s your responsibility to monitor them and make sure they go outside frequently. Do not discipline the dog for going inside the house! It’s your fault, in fact hit yourself with a newspaper for not paying close enough attention. If you discipline the dog for going inside you can actually make the problem worse. It’s not too much work but it can be very frustrating at times if you’re not paying attention to the dog. The biggest pitfalls you will make as an owner are not controlling their food and water intake and giving them free reign in the house. Please for the sake of your carpet don’t use puppy pads or other “training” devices that allow them to go inside the house. You will never have clean carpets again! If your still having issues give us a call we’re more than happy to help!